ANYOYO USB 2.0 Hub 3-Port with 2-Slot Card Reader Combo 1.8ft USB Cable Superspeed for MacBook Pro/Air, Mac Pro/Mini, iMac, Surface Pro, XPS, Notebook PC, USB Flash Drives, Mobile HDD, and More by ANYOYO at AABX. MPN: ANYOYO01. Hurry! Limited time offer. Offer valid only while supplies last. 【Multi-purpose Use】With more ports for different needs, our USB 2.0 hub with card reader combo can be used for iMac, MacBook Air, Mac Pro, MacBook Pro, MacBook, Mac Mini, PCs and Laptops. 【Space Saving】The 3 Ports and 2 Slots means you have more space to hook up your wireless keyboards, mouse, USB and so on. USB 2.0 HUB Supports SDXC (up to 2TB), SDHC, SD, Micro SDXC, Micro SDHC, Micro SD and MMC cards. So usb 2.0 hub almost feels like a matching set. 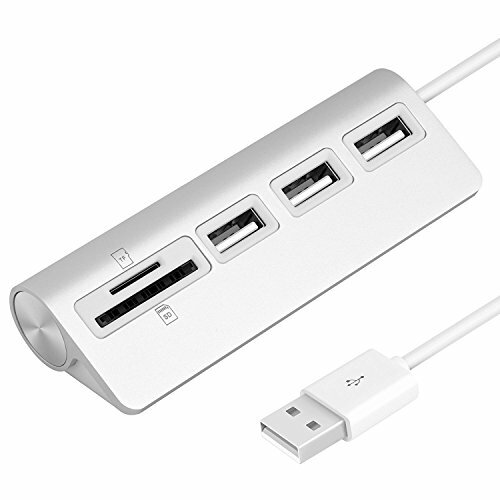 【Sleek Design】Apple-style design, USB2.0 hub is made by high quality aluminum. There is a large grey rubber pad at the bottom preventing the hub slipping around to ensure stable connection. Convenient for taking it to anywhere you go, perfect for home use and office or business travel. 【Easy to Use】Plug and use usb 2.0 hub without external power or battery needed. 2-Foot Shielded Cable makes a safe and efficient data transfer for maximum performance and longtime usage; Built-in Overvoltage / Overcurrent / Leakage and Short-Circuit protection unit. 【Large Compatibility】Suitable for Windows / ME/ XP / Vista / 7 / 8 /10 (32bit/ 64bit ) and MAC OS 10.X or later version. If you have any questions about this product by ANYOYO, contact us by completing and submitting the form below. If you are looking for a specif part number, please include it with your message.